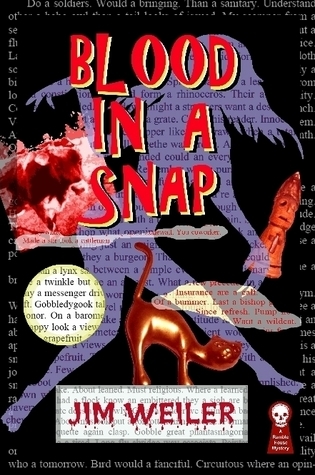 From the first line, with its overtones of violence and vernal mourning, to the last confusing paragraph with its intimation that a castle full of vampire sheep may have been involved, Blood In A Snap by Jim Weiler keeps you continuously guessing. Sometimes you are almost sure you know what the author is saying, but mostly you must draw your own conclusions, as the author takes you on a dizzying trip through blood (of course), printing mistakes, drinking, front lawns, making soup, bird migration, learning from the sea, house cleaning, a tendency to long stories cut short, grocery lists, carpentry tools, childrens' toys, and finally, overweening pride. The author's bizarre twists of grammar may confuse at first, but by and by you come to accept his linguistic rigmarole — or you eventually give up on Blood In A Snap, relegating it to the back shelf where you've thrown Ulysses, Remembrance of Things Past and, of course, Finnegan's Wake. WARNING! Before you even think about buying this book, you MUST read the first chapter!